Blogger of the Week: Blogaversary Competition Time! It is our first Blogaversary this weekend! This blog has been such a great success and it's thanks to all the people who have taken the time to answer my questions, send in photos and to those who read and comment on the posts too. I thought it would be fun to have another competition as we did for the Six Month celebration. I used the random number generator to choose 9 photos from the last six months. All you have to do is identify the 9 bloggers and leave a comment. The closing date is in 2 weeks time, Friday 16th March and I will choose one person to win a £10 (or equivalent in your currency) voucher to the stitching store of your choice. Any store which will allow me to buy a voucher online using PayPal that is. Comments will be moderated until then. Remember, the photos are all from the last six months, so don't go back beyond the beginning of September 2017! Thank you so much for this chance to win Jo. YOU are the best! That was fun. Thanks for the great competition, Jo. 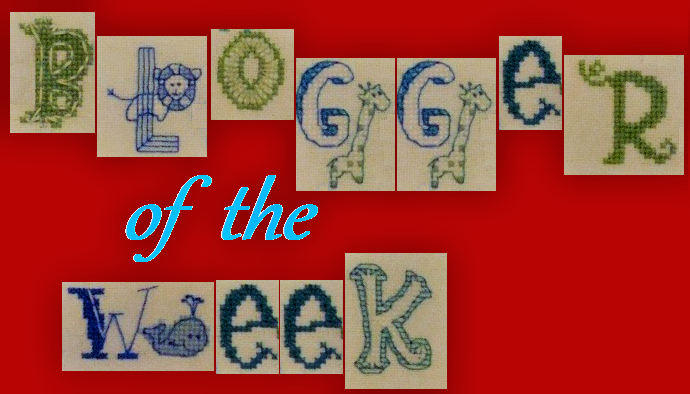 Hi Jo, I really enjoyed looking through the Blogger of the Week posts again. 4. Carla of Alaska Wolf Pack. This is fun! I've enjoyed reading back through all the last 6 months posts. Here goes with my list: 1. Melanie the WIP Slayer; 2. My Bored Nerdy Self; 3. Stitches by Carin; 4. Alaska Wolf Pack; 5. Kitten Stitching; 6. Beth's Needlework Stash; 7.Faithfully Stitching; 8. Aimetu's Stitching; and 9. At Brigitte's Place. Hope I've got that right! Hooray, I guessed some! I did double-check though. It was fun going back and seeing all the stitches again; everyone has done such lovely work! I have been a bit away from blog reading lately but decided to go back and see which blogs I haven't visited and this competition was a nice chance to do so. So here goes. 1.Melanie of The WIP slayer. 2.Lorynn of My bored nerdy self. 3.Carin of Stitches by Carin. and last but not least 9. Brigitte of At Brigitte's Place. Good luck everyone! I won't enter since I won last time!